Gentlemen, even to-day I can throw no light on this dark incident. I am sorry I am unable to do so. From what I have said before, you know that at one time Refet Bey had been succeeded by Selaheddin Bey, who had arrived at Samsoon on an English ship and who had brought him an invitation to go to Constantinople. At that time he had preferred to resign so that he could return there, and mean while the Government in Stambul had issued an order that he was to be arrested, and myself at the same time, and that we were to be sent to Constantinople. I must confess my own incapability to do this. It is true that Ali Riza Pasha s Cabinet had replaced Ferid Pasha s. But we all known that the means at hand for detecting and punishing the errors of the new Cabinet were identically the same. Refet Pasha s weak and remarkable behaviour was responsible for the fact that no serious dispositions for defence could be established at the Aidin and Salihli fronts until a regular army had been formed. Let us now return to the narrative of events from the place where we left off. We answered this short request in a rather exhaustive telegram, which I shall quote literally, although I am afraid I shall tax yuor patience by doing so. Reply to telegram of 8 th November, No 8084. 1. The most important civil officials of some of the vilayets, amongst them those of Angora, have been ordered to come to the telegraph instrument for the purpose of being interrogated in a threatening manner regarding an inquiry which was to be held con cerning certain acts directed against Ferid Pasha s Cabinet during the course of the national movement, the reasons that gave rise to the accusations and their relation to the law. 2. In a telegram in cipher, as though it was a very mysterious affair, the Vilayet of Sivas had been asked what had caused the death of the Mutessarif of Tokat, who had died in a natural way from an attack of typhoid fever, from which he had been suffering for a long time. 3- During the confidential conversation which the Minister of the Interior, accompanied by the Minister of Justice, had had with the national delegation that came from the Balikesri front, it was reported that the Minister of -Justice (in the presence of the members of this delegation) had asked whether there was any possible way for proceed ings to be taken against the leaders of the national movement! 4. Even at the present day the Minister retains Keshfi Bey, Under Secretary of State in the Ministry of the Interior, in his office, in spite of the fact that he was the evil genius and confidant in all the acts and machinations of Aadil Bey the former Minister, whose treason has been exposed by material proof, while his chief care as a true patriot when he took office should have been to dismiss him. On the advice of this same official, the Minister is still transferring other officials in his Department. You will find it quite natural that officials appointed by such a chief do not exactly enjoy the confidence of the nation. All Ulvi Bey, the former Mutessarif of Kaisaria, for instance, who adopted an unfriendly attitude towards the national movement from the very beginning, and who, after having been suspended from his duties by the people, escaped arrest and banishment solely on account of his illness, notwithstanding his notorious inefficiency and inexperience in administration, was given an appointment at Burdur. Edhem Bey, also, who had been sent back to Constantinople, because of his in capacity and the impossibility of allowing him to remain in the Sanjak of Djanik, has been appointed to Menteshe. Moreover, Djavid Bey, the former Mutessarif of Nigdeh who had recently been brought to Sivas, has been appointed Mutessarif of Aidin; and, lastly, the Mutessarif of Antalia, one of Djemal Bey s creatures, the traitor who was formerly Vali of Konia, still remains at his post, in spite of the repeated applications and remonstrance of the people. 5. The management of a Department, equally as important as that of any other, has been given to an Armenian. 6. No alteration has been made in the control of the Press and the Agency service. 7. It is well known that the unity of the nation is the only power by which the fate of the nation can be secured, and it is the national organisation alone that can maintain this unity. Those who are endeavouring to compromise the sacred cause of upholding this unity and this organisation a cause whose aim is the safeguarding of the country from disintegration and partition, and the security of the independence of the State and Nation are the mali cious politicians who are the agitators in Constantinople. They can only be rendered innocuous by stern and efficacious measures being taken against them. The first way to bring about this result is to confide the Direction of the Police to a man who shall be selected from among honourable, patriotic and competent persons who have the courage to act on their own initiative. Your Excellency is well aware, however, that the present Director of Police is the chief support and a strong partisan of the old Cabinet that is accused of treason and of their creatures. As can be seen, on the other hand, from the letters written by Said Molla to Mr. Frew, the English clergyman, the official in question is a supporter and a refuge of the opposition, that is to say, of the enemies of the nation. His Excellency Salih Pasha also acknowledged this fact at Amasia. In other words, this means that the Minister of the Interior not only has no scruples about confiding the destiny of the country and the nation to the hands of such a man, but he may even think that there is an advantage in doing so. As for Kemal Pasha, the Commander of the Gendarmerie, consider ing beyond all doubt that he is as dangerous to the national movement as he is to yourself, can it be believed that his retention at his post is due to the good will of the Minister of the Interior? Mustapha Kemal In the name of the Representative Committee. 1. The elections must take place in a lawful and proper manner. 2. The Chamber of Deputies shall meet in Constantinople. 3. The communications sent to you hitherto by the Government, to the effect that you are prohibited from interfering in the affairs of the State on behalf of the national organisation, are hereby officially confirmed. 4. It is clearly evident that the demands expressed by you in a number of your telegrams have given the impression that you are assuming authority. These statements revealed the true state of affairs. 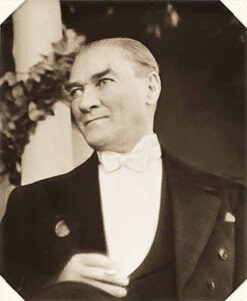 The Cabinet did not care to admit that among those who held convictions that were antagonistic to the national organisation were the enemies of the country and the nation ; they made no distinction between the national organisation and those traitorous organisations that had been formed by our enemies between Ali Kemal or Said Molla and ourselves. The incidents at Ada Basar, at Karadsha Bey, at Boskir and Ansawur were not regarded by them as crimes. It was only on the 28 th November, that is to say, eighteen days after he sent it off, that I received the letter which Djemal Pasha had specially sent to me at Sivas on the 10 th November, in which he had returned to all the questions upon which we had been corresponding, summarising them and commenting on them. “It is evident that the Padishah will refuse to give his consent to the Assembly meeting in those circumstances. The Americans have hinted have even expressly stated that attacks on the Chamber of Deputies by the Allied troops might be to the advantage of the Empire, but they did not believe that this would be at all possible.” Then he told us, as though we did not know it already, that “the fat-heads among the officials who are not inspired by the spirit and sentiments that guide the national movement, put their trust in the armies of the occupation:” and he added that “the majority of the members of the former Cabinet are included in this category.” To illustrate this contention by a typical example, he quoted the instance when the Director of Police, who was clearly included, was superseded. Comment on the logic, the judgment and the truth of the views expressed in this letter, as well as his remarks in general, is quite superfluous. Damad Sherif Pasha, Minister of the Interior, did other things to destroy national unity and drive the nation into a state of passive resistance against the culpable efforts that were still being made and which were multiplying. We observed that he induced other Departments to adopt similar tactics. We replied : “If you are unable to convince the Imperial Govern- men t who have promised to conform to the national aspirations and who in accordance with this promise enjoy the complete support of the national organisation of the necessity for the removal of this Cadi, it is evident that the only thing left for you to do will be to turn him out/ The number of officials appointed in Constantinople and sent back, as this Cadi was, was naturally very considerable. You will see clearly from the evidence I will now lay before you, what little justification All Riza s Cabinet had to criticise us, and how careless they were in the choice of the expressions they used.